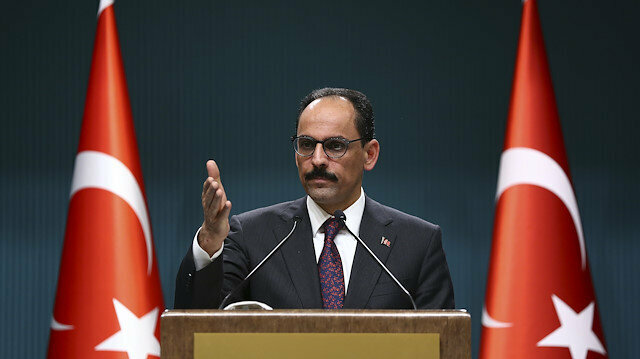 Turkey’s presidential spokesman İbrahim Kalın on Sunday rejected U.S. claims that it was targeting Kurds in a planned upcoming military operation in Syria. "The claim that Turkey is targeting Kurds is irrational. Turkey’s target is the Daesh and Kurdistan Workers’ Party (PKK) terror groups,” Kalın said. "Claiming that a terror organization represents Kurds, is first and foremost, a disrespect to our Kurdish brothers and sisters. One of Turkey's aims in the fight against the PKK and its Syrian extensions is protecting Kurds from this terror group's persecution and oppression," he added. White House national security adviser John Bolton earlier on Sunday said that the U.S. withdrawal from Syria relied on Turkey agreeing to protect the United States' Kurdish allies. Bolton said Trump's position is Turkey may not kill the Kurds and that the U.S. withdrawal would not take place without an agreement on that.